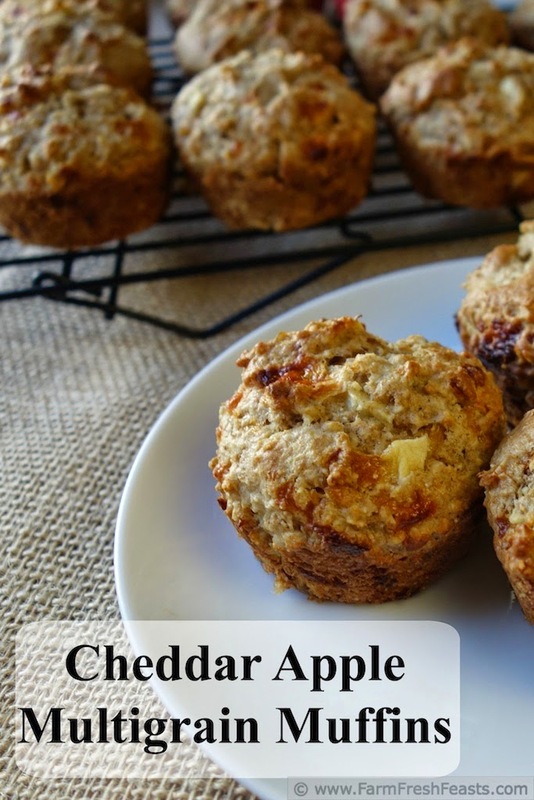 Grated apple and cheddar cheese with an assortment of whole grains make these muffins a delicious Fall treat. What? 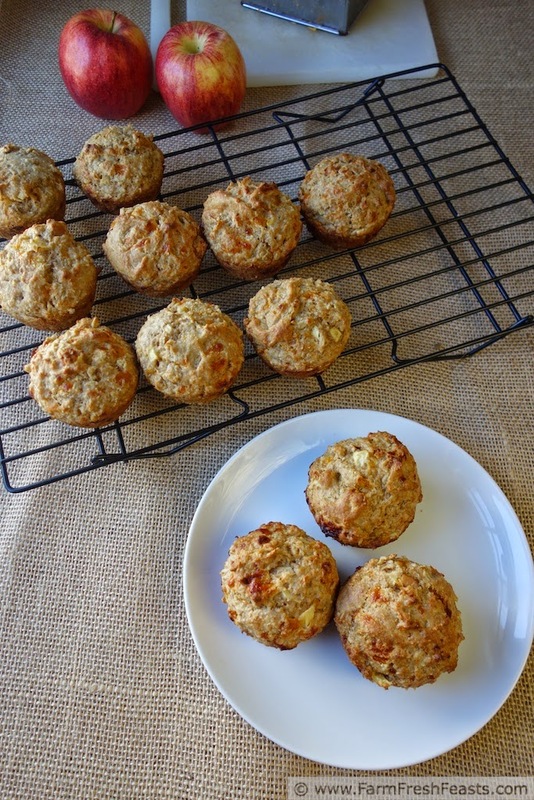 A departure from my standard soaked oatmeal muffins? Yep. The dog woke me up extra early so before I was fully conscious I'd added oats, cornmeal, and whole wheat flour to the bowl with the buttermilk. The dog went back to bed, and I made muffins. When I'm solo parenting while my spouse is deployed, a favorite easy meal is apples, popcorn, and a protein. Sometimes it's popcorn with sliced apples and peanut butter, but usually it's a platter of apple slices, cheese chunks, and a big bowl of popcorn. This is easy to fix for dinner & a show treat night. While my kids were in braces I really missed that meal (no popcorn allowed) and I had to come up with alternatives. I'd been thinking of adding a bit of cornmeal to my muffin batter--the crunch goes nicely with the tender crumb from adding cheese--and I'm pleased with the result. 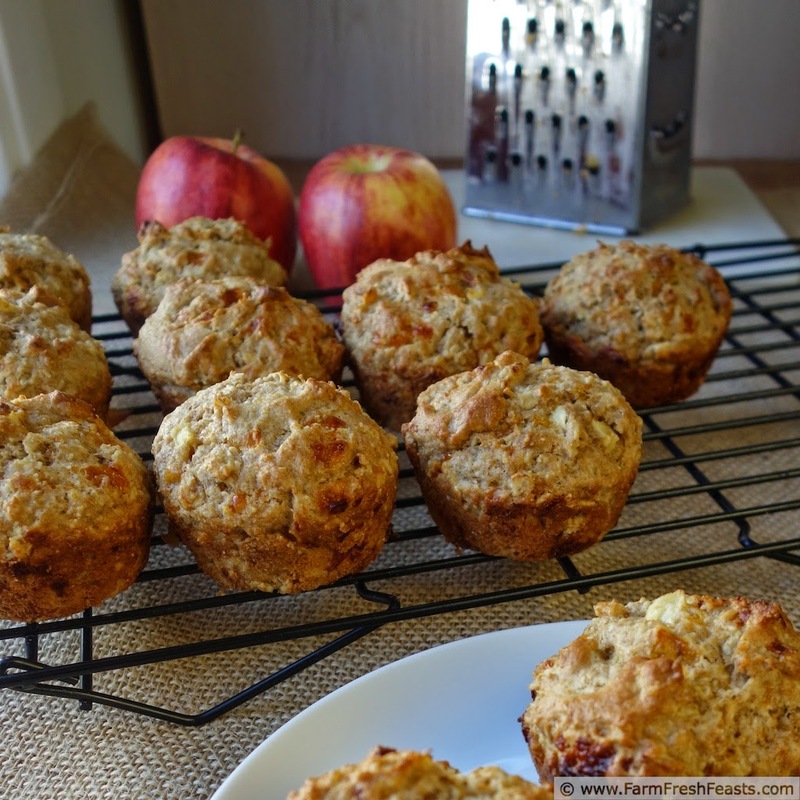 These muffins are not too sweet, and in fact would be tasty with a bowl of Chicken Cider Stew or spread with some apple butter. Multigrain and multipurpose, I'd say. In a large bowl, combine oats, flour, cornmeal, and buttermilk. Set aside for 30 minutes to an hour to soak (or overnight). When you're ready to bake, preheat oven to 400 degrees Fahrenheit and spray a 12 well muffin pan with vegetable oil. Add the egg, oil, brown sugar, apple and cheese to the bowl and mix thoroughly. Sprinkle the baking powder, baking soda, and salt on top, and gently stir in. Scoop** batter into prepared pan. Bake 18 minutes, cool in pan 5 minutes, then remove from pan and cool on rack. Serve warm or at room temperature. Makes 12 muffins. **My scoop holds 3 Tablespoons (1 ½ ounces) by volume, though the muffin batter is mounded in the scoop so I'm pretty sure I'm putting a good 3 ½ to 4 Tablespoons into each muffin well. The muffin wells in my regular 12 well muffin pans each hold 3 ounces by volume. Apples and cheddar remind me of New England apple pie. There's a big thing around these parts about melting a thick slice of cheddar on top of a wedge of pie, and I have to admit, it's pretty darned tasty. Apple pie + cheddar is a thing of beauty, like PB& J or hot fudge and a spoon. Um . . . If this is what Fall means, I say bring it on. You have to know I just adore this flavor combo. I'm putting buttermilk on this weekend's grocery store list. It'll give me a great excuse to try out my new Polish Pottery muffin pan. You're going to love it. Having a half gallon of buttermilk on hand means I'm open to so many magical possibilities. Spur of the moment chocolate waffles yesterday, planned soaked oat muffins any time. I love cheddar combined with apple. These look great! I think my kids will adore them too! My kids will mostly happily eat all my muffin creations--but sometimes I forget sugar or something and they won't tell me! I finally sit and take a bite and . . . needs jam or something, then I realize I forgot. One of the reasons it helps me to gather all the ingredients and take a photo first--to see what I've left out. I should investigate a translate bar--good idea. 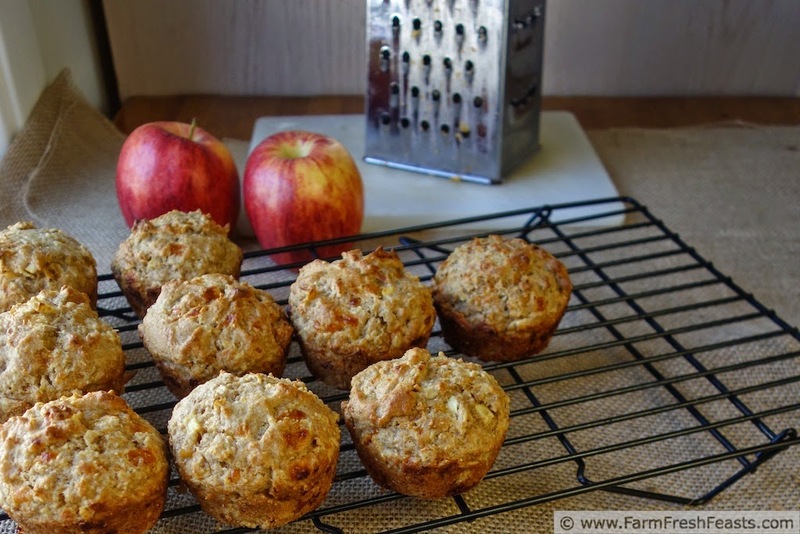 Your recipe for Cheddar Apple Multigrain Muffins looks and sound so good. This is one I will try soon with all the fresh apples now available. Thank you for sharing with the Clever Chicks Blog Hop! I hope you’ll join us again next week!